WAILEA, MAUI, HAWAII (10 June 2018) Renowned scientists from throughout the Pacific meeting on Maui this past week have recommended new management measures for the Hawaii shallow-set longline fishery targeting swordfish in response to a recent spike in the fishery’s interactions with sea turtles. The fishery is currently managed through annual fleet-wide limits for loggerhead and leatherback turtle interactions and is closed for the remainder of the calendar year when either limit is reached. Members of the Scientific and Statistical Committee (SSC) recommend that the Western Pacific Regional Fishery Management Council adopt a management framework that provides early detection and response to higher interaction rates and minimize further interactions while keeping the fishery open during peak swordfish season (October through March). The Council will consider the recommendation when it convenes June 11 to 13, 2018, at the Wailea Beach Resort on Maui. NOAA Assistant Administrator for Fisheries Chris Oliver is scheduled to participate in the meeting. The SSC recommended that the Council consider annual fleet-wide hard cap limits combined with individual trip limits for loggerhead turtles as an economic incentive to minimize interactions. Once a vessel reached the allotted limit interactions for a trip, it would have to return to port. The SSC also recommended that the Council consider establishing hard caps that correspond to the fishing season rather than the calendar year and recommended annual hard cap levels that are consistent with a new biological opinion being developed by the National Marine Fisheries Service (NMFS). NMFS plans to have the final opinion by Oct. 31, 2018. 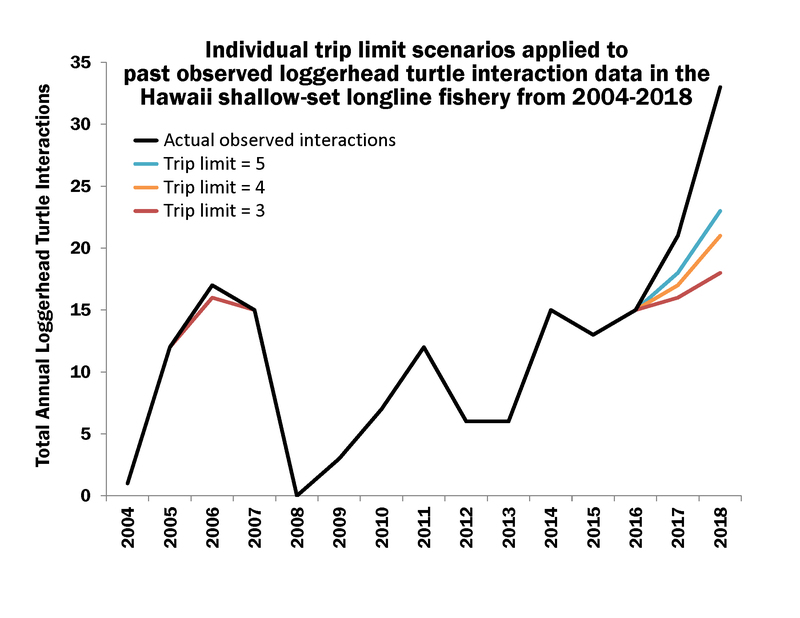 The SSC noted that Hawaii shallow-set fleet likely poses less biological risk to turtle populations than other fleets operating in the region, as the Hawaii vessels must adhere to numerous regulatory measures, such as the interaction caps, mandatory observers on all trips to monitor protected species interactions, mandatory use of circle hooks and mackerel-type bait to reduce the risk of hooking sea turtles and mandatory equipment for and training in the safe release of live turtles. It was also noted that North Pacific loggerhead nesting beach trends in Japan were much higher in the last decade than in previous years and that the population is experiencing growth of around 9 percent per year. The scientists encouraged development of a non-regulatory, industry-led pilot program to address sea turtle interactions in the fishery, as well as research by NMFS to better understand the factors associated with spikes in the fishery’s interactions with sea turtles. Main Hawaiian Islands Deep-7 Bottomfish: The SSC noted that the 2018 benchmark stock assessment with catch projection to 2022 is the best scientific information available for the main Hawaiian Islands bottomfish stock complex. Comprised of six deep-water snappers and one grouper, the Deep 7 are highly prized by local consumers and chefs. Based on the assessment, the maximum sustainable yield for the fishery is estimated at 509,000 pounds. The current exploitation rate is roughly half that level. The SSC recommended an acceptable biological catch (ABC) of 508,000 pounds annually associated with a 42 percent risk of overfishing for fishing years 2018-19, 2019-20 and 2020-21. The Council uses the ABC to specify annual catch limits, which can be less than or equal to the ABC. 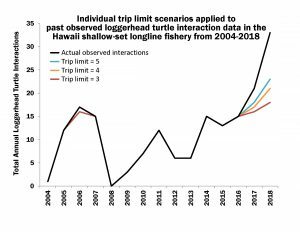 The SSC also discussed potential changes in the fishery such as a reopening of the State of Hawaii’s Bottomfish Restricted Fishing Areas (BRFAs). While opening of the BRFAs is still uncertain and would require a long regulatory process, the SSC said the State should review and consider previous SSC recommendations and advice on research priorities prior to the opening of BRFAs in order to scientifically monitor and measure the impact of this action. Among these are redesign of the reporting grids to ensure they collect BRFA catch data and development of a stock assessment for uku. Status of Tuna in the Eastern Pacific Ocean: The SSC reviewed the Inter-American Tropical Tuna Commission (IATTC) 2018 stock assessments that indicate bigeye and yellowfin tuna in the Eastern Pacific Ocean (EPO) are experiencing overfishing but are not overfished. The change in stock status for bigeye, which last year was not experiencing overfishing, is attributed to the lower catch per unit effort (CPUE) and size composition in the Japanese longline fishery and high exploitation rates by purse-seine vessels on small bigeye. The SSC acknowledged that the IATTC staff is recommending a limit on the number of purse-seine sets on floating objects and unassociated schools in addition to the current 72-day purse-seine closure. It also noted the unknown status of the EPO skipjack stock and encouraged future research by IATTC that could support a formal stock assessment. Pelagic Research Plan: The SSC recommended that the Council endorse the draft Pelagic Fisheries Research Plan, which the Council will use to inform its Pacific Islands Fisheries Research Program. The plan prioritizes the following issues for focused research: 1) Bigeye connectivity and spatial stock structure with an emphasis on high-latitude bigeye catches by the Hawaii longline fishery in the Western and Central Pacific Ocean (WCPO) and EPO; 2) Stock assessment for incidentally caught species including opah (moonfish), monchong (pomfret) and shortbill spearfish; 3) Effects on fisheries from spatial closures and large-scale marine protected areas; 4) Shark abundance and depredation in the Mariana Archipelago; and 5) Advancing ecosystem-based fisheries management. 2017 Annual Stock Assessment and Fishery Evaluation Reports: The SSC reviewed highlights of the draft 2017 Annual Stock Assessment and Fishery Evaluation reports for federally managed fisheries of Hawaii, American Samoa, Guam, the Commonwealth of the Northern Mariana Islands and the Pacific Remote Island Areas. The SSC noted the challenges of expanding the results of creel surveys to monitor the fisheries and questioned the reliability of the expansion to estimate catch, effort and catch-per-unit-effort. The SSC recommended the Council request NMFS explore other reliable means of expanding the creel survey data. Five-Year Research Priorities: The SSC reviewed updates to the Council’s five-year research priorities, including changes suggested by the Council’s Social Science Planning Committee and Protected Species Advisory Committee. The SSC concurred with the changes and recommended that the top priorities be sent to NMFS for consideration in its Annual Guidance Memo. Hawaii Deep-Set Fishery for Tuna: The Hawaii deep-set longline fishery for bigeye tuna to date this year has interacted with four false killer whales inside and three false killer whales outside the US exclusive economic zone around Hawaii. Regulations for the fishery include closure of an area known as the Southern Exclusion Zone when two false killer whale interactions occur that are considered to be a serious injury. One of the interactions has been considered a serious injury, and the three latest interactions are under review. Current mitigation measures require the fishery to use “weak hooks” that are meant to straighten and release a false killer whale should it get hooked or snagged. The SSC found the measure to be ineffective and dangerous to fishermen. It strongly supported development of modified gear requirements and release procedures to improve the success rate of hooks straightening so as to allow safe release of false killer whales without trailing gear. Kahekili Herbivore Fisheries Management Area: The Hawaii Division of Aquatic Resources reported on ongoing studies evaluating the effect of the Kahekili Herbivore Fishery Management Area. Declines in live coral diversity and complexity and an increase in invasive benthic algae spurred establishment of the area in 2009. Fishing for surgeonfish, parrotfish, chub and urchins is prohibited, but fishing for other non-herbivorous fish is allowed. Since establishment of the area, small parrotfish and surgeonfish species biomass has increased while biomass of large parrotfish species and the Naso spp. surgeonfish initially increased and then declined. Crustose coralline algae increased while coral and macroalgal cover decreased. The decrease in live coral cover was attributed to bleaching events. The decline in large parrotfish and surgeonfish was attributed to illegal fishing based on anecdotal information. The SSC questioned the assumption that illegal fishing caused dramatic reductions in some reef fish species when unexplored causes could be at play, including land-based nutrient loads, sediment, pollutant inputs, sampling design and methods, changes in urchin communities, effect on sport fishing CPUE for non-herbivorous species, change in benthic cover, movement patterns and large-scale recruitment episodes. The SSC suggested ecosystem simulation modelling to further examine the impact of the catch regulations on the entire coral reef community and use of these data to validate existing models. Background information and the agenda for the June 11 to 13 Council meeting at the Wailea Beach Hotel in which these SSC recommendations will be considered can be found at www.wpcouncil.org or by emailing info.wpcouncil@noaa.gov. As part of the meeting, a Fishers Forum on the Hawaii Deep 7 bottomfish fishery will be held Monday, June 11, from 6 to 9 p.m. at the Maui Beach Hotel in Kahului. The Council meeting and Forum are open to the public. Scientific and Statistical Committee: Debra Cabrera (St. John’s School, Guam); Frank A. Camacho (University of Guam); Milani Chaloupka (University of Queensland); Erik Franklin (Hawai`I Institute of Marine Biology); Shelton Harley (Ministry for Primary Industries, NZ); Ray Hilborn (University of Washington); Justin Hospital (NMFS Pacific Islands Fisheries Science Center); David Itano (fisheries consultant); Donald Kobayashi (NMFS PIFSC); James Lynch (K&L Gates LLP); Steve Martell (SeaState Inc.); Domingo Ochavillo (American Samoa Department of Marine and Wildlife Resources); Ryan L. Okano (Hawai‘I Division of Aquatic Resources); Graham Piling (Secretariat of the Pacific Community); Kurt Schaefer (Inter-American Tropical Tuna Commission); Craig Severance (University of Hawai`I at Hilo, retired); Michael Tenorio (CNMI Division of Fish and Wildlife). Western Pacific Regional Fishery Management Council: Secretary of Commerce appointees from nominees selected by American Samoa, CNMI, Guam and Hawai`I governors: Edwin Ebisui Jr. (chair); Michael Duenas, Guam Fishermen’s Cooperative Association (Guam) (vice chair); John Gourley, Micronesian Environmental Services (CNMI) (vice chair); Dean Sensui, film producer (Hawai‘i) (vice chair); Archie Soliai, StarKist (American Samoa) (vice chair); Michael Goto, United Fishing Agency (Hawai‘i); Christinna Lutu-Sanchez, commercial fisherman (American Samoa). Designated state officials: Raymond Roberto, CNMI Department of Lands and Natural Resources; Suzanne Case, Hawai`i Department of Land and Natural Resources; Matt Sablan, Guam Department of Agriculture; Henry Sesepasara, American Samoa Department of Marine & Wildlife Resources. Designated federal officials (voting): Michael Tosatto, NMFS Pacific Islands Regional Office. Designated federal officials (non-voting): Rear Adm. Brain Penoyer, USCG 14th District; Michael Brakke, US Department of State; Brian Peck, USFWS.